1. WordPress dashboard go to "Plugins" and click on "Add New." 2. In the search box, type in "MailChimp" and submit the search. 3. Click "Install" for the MailChimp for WordPress plugin and follow any necessary prompts on screen, then click "Return to Plugin Installer." To check that the plugin is installed and activated, from the WordPress dashboard go to "Plugins" and click on "Installed Plugins." 1. Select "activate" to begin using the new plugin.This will add a new entry titled, "MailChimp for WP," into the navigation menu on the sidebar. 2. 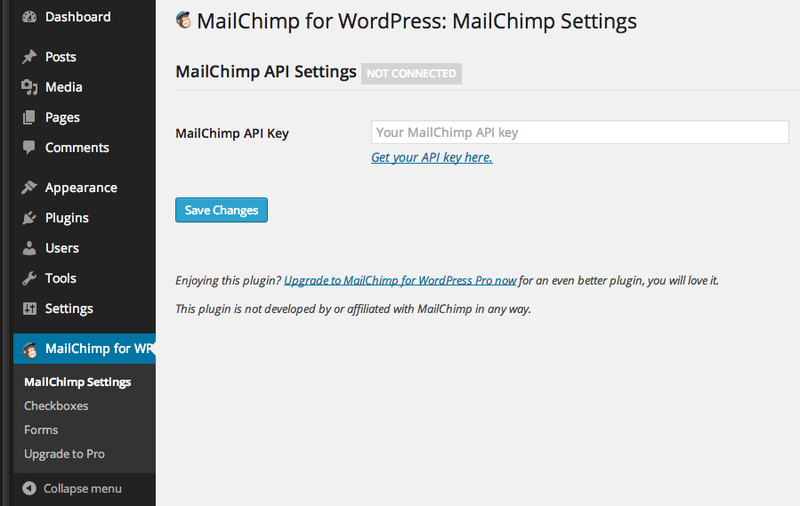 Click "MailChimp for WP" setup the plugin. 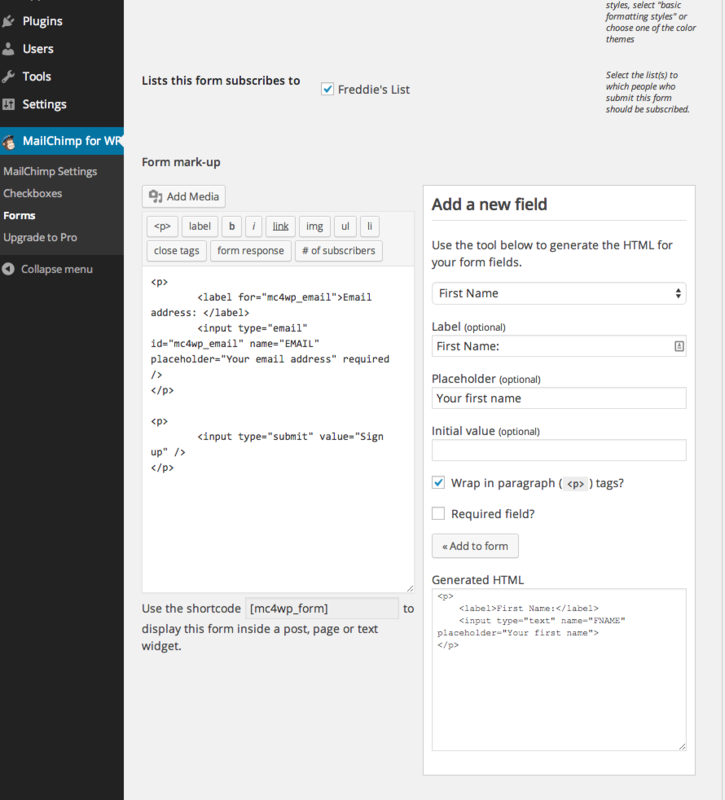 To connect your MailChimp account you will need to enter your API keys into the necessary field. The plugin provides a convenient link, below the field, which will direct you to the API key in your MailChimp account. You must be logged in to your MailChimp account for the link to work as expected. 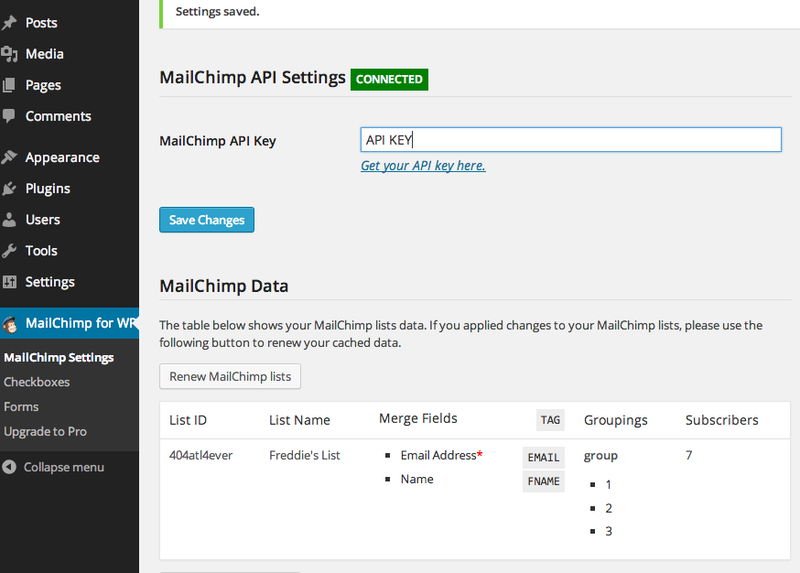 Once the API key is added and the changes saved, your list information will populate in the "MailChimp Data" area. This will give you a break down of each list and the fields associated with them. The plugin will offers you two type of options for collecting subscribers. 1. Firstoption is to add a subscription checkbox to the comment and/or registration forms which would allow visitors to subscribe to your list during the commenting or registering prcess. 2. The other option is to build a signup form to add to any or all of your website's pages. 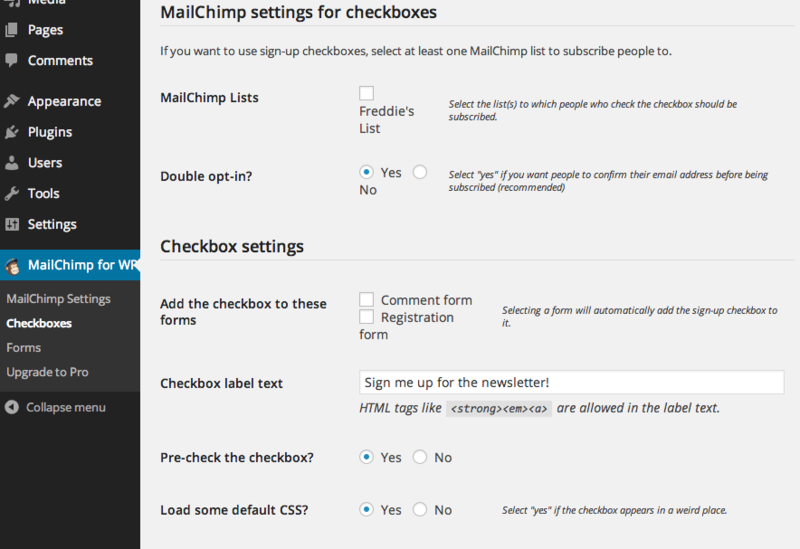 Within the MailChimp for WP sidebar menu, choosing "Checkboxes" will allow you to configure the checkboxes used for signups. In this area, you can choose which lists subscribers are added to, double opt-in settings, and additional styling elements. Check the "Forms" menu, you can Add and customize the HTML for the signup form to place within your Wordpress site. By default, the form will be setup for an email section. 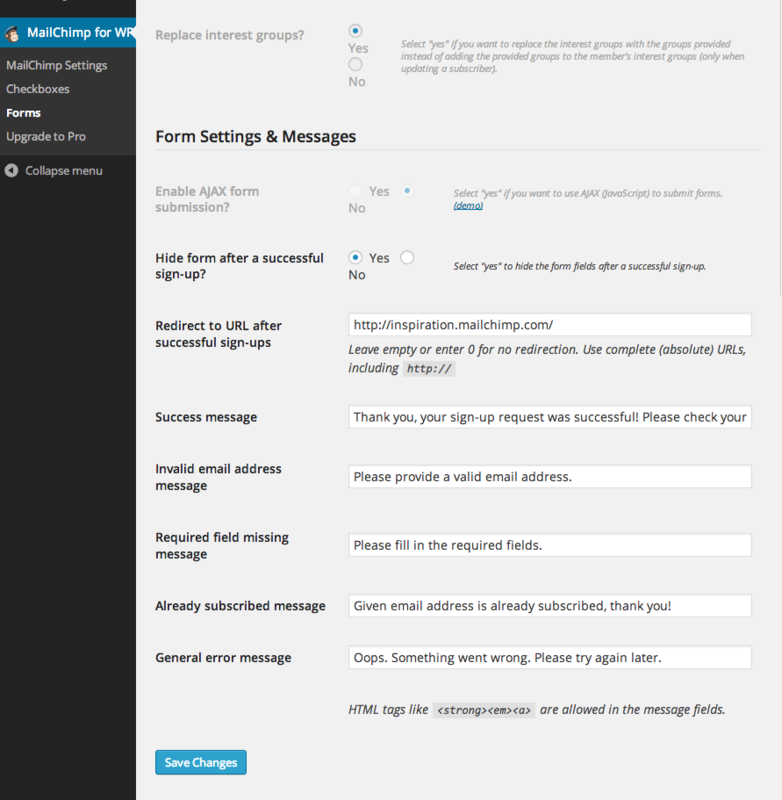 To add additional fields to the form use the "Select MailChimp field" drop-down under the "Add a new field" area. Before adding the additional fields, you have the ability to edit the field's properties. In"MailChimp Settings," you can manage the signup options for the form, such as double opt-in, and the ability to send a welcome email. Finally, in the "Form Settings & Messages" area you can adjust messages shown when a form submission is complete as well as any error messaging. Once you've finished all setting and setup and your form, you can publish it to your Wordpress site. To add the form to one of your Wordpress pages, either copy the HTML generated under "Form mark-up" or copy the short-code provided below the code. Click to edit the Wordpress page or menu you wish to use and paste in the code where desired.